Can this cunning camera concept compete with the SLRs of the world? Ricoh may not be one of the figure-heads of the camera world in Europe but in its native country of Japan, the brand is a 'must-have' in a nation bursting with tech goodness. While the company hasn't suffered too badly in a crowded European camera market-place, there's not been anything to raise eyebrow's and get the company's name on consumer's lips. Enter the Ricoh GXR, a camera enthusiasts will be talking about for some time to come. At first-look the Ricoh GXR is your normal run-of-the-mill compact camera. Its black, magnesium-alloy chassis is unassuming with more than a tinge of retro to its looks. This style is very much en vogue within camera circles at the moment, and it's all because of Olympus' digital re-boot of its Pen series. And like the Olympus E-P1, the Ricoh GXR offers a substantial amount of professional imaging quality in what is a diminutive frame. But this is where the similarities end, as Ricoh has shunned the Micro FourThirds system which has been wholeheartedly adopted by the likes of Panasonic and Olympus and decided to go out on its own with a proprietary format. The new format not only means you can buy one camera body and switch lenses - but sensors and processing units too. Ricoh has developed something called an 'interchangeable unit camera system' which is far less clunkier than its awful moniker makes it out to be. 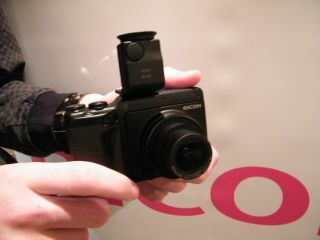 Essentially, each Ricoh GXR chassis comes without a camera sensor, lens or processing engine. All of this is added in the form of a 'unit' which you slot into the body by way of a slide-in mount system. This is instead of switching lenses as you would on a DSLR. Ricoh believes that it "has created a system without constraints" and something that brings "SLR functionality to a compact body". When TechRadar tried the slide-mount system we have to admit that it was simple enough to use but the choices of lens/sensor units is currently very limited. When the system is launched in December two 'units' will be available: a Lens A12 50 mm F2.5 Macro camera unit which features a 12.3MP CMOS sensor; and the Ricoh Lens S10 24-72 mm F2.5-4.4 VC camera unit which houses a 10MP CCD sensor. Confusingly this means that you will be using two different sensors for your image-taking. The reason there was no 'one sensor' choice was because Ricoh chose "the most compatible sensors for the chosen lenses". While this is a perfectly valid reason it does mean that in theory the camera will offer two varying types of image quality (something we could try out on our brief hands-on with the product).